Tips for Choosing the Right Deck Railing - GNH Lumber Co. Tips for Choosing the Right Deck Railing - GNH Lumber Co. The deck railing system you choose will be your deck’s most visible feature, so making the right railing choice is key to having your finished deck look as good or better than you imagined it at the start. Are you in need of a partial or full deck renovation? GNH Lumber is ready to help you transform your old deck into an outdoor space your friends and family will enjoy all season long! Visit us in Greenville or Windham to discuss your decking project. Before you start thinking about your deck or its railings, check with your local zoning board first to see if there are any codes or regulations you need your project to adhere to. For instance, most townships require the balusters on the deck’s railing to be spaced no more than 4 inches apart. This is required so that children can’t slip between the balusters or get their heads stuck in them. In addition, in most areas, a permit will be needed for decks built higher than 24 inches off the ground. Every township has its own laws and regulations, so always check yours before you start work, because the last thing you want is to wrap up installation only to have the inspector fail the build because you’re not compliant with local laws. Height is one of the most important aspects when it comes to your deck railing. 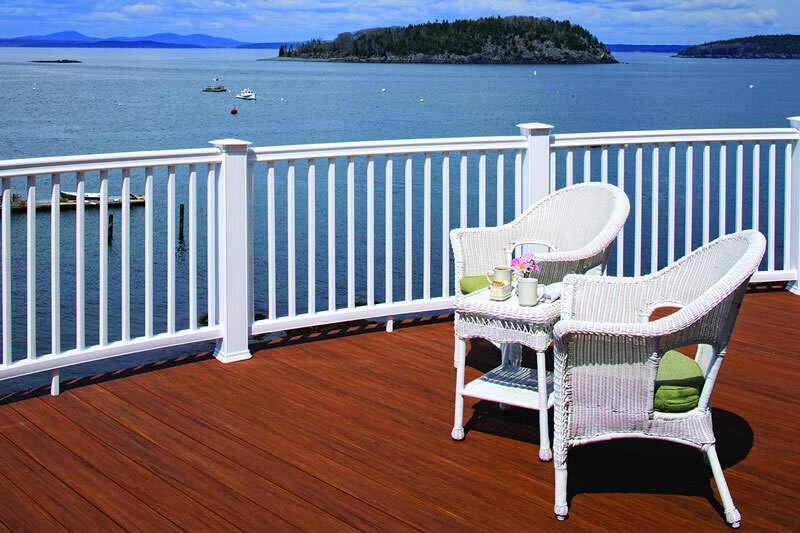 Usually, a deck’s railing should be anywhere between 36 to 42 inches. Any shorter in height, and it could be unsafe. Any higher, and it will restrict your view of the surrounding area. Therefore, keep it within that sweet spot for the best (and safest) results. All of TimberTech’s railing products are backed by a 25-year limited warranty and most are available in a range of colors, so you can create a deck with striking visual impact. 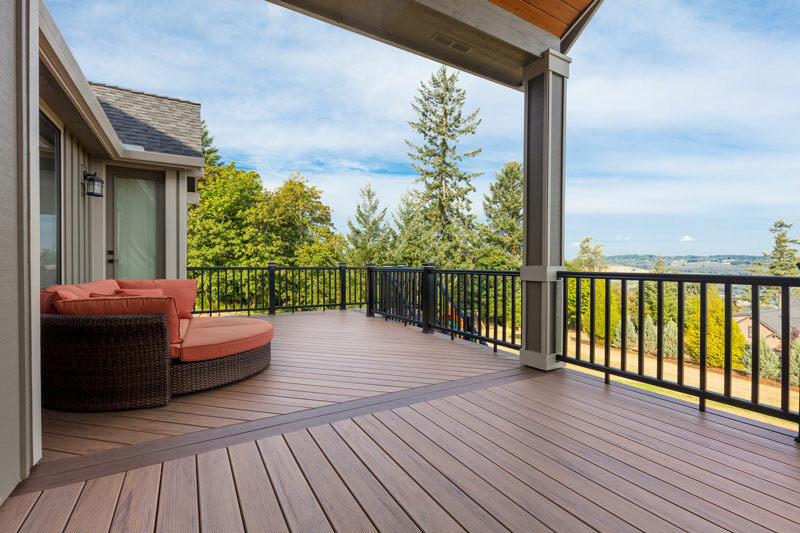 If you’re in the midst of a deck design but you’re not sure which railing system is going to look best with your deck, you can get a glimpse of your finished project by using AZEK Building Products’ new Deck Designer program. The AZEK Deck Designer is designed to help homeowners create their dream deck right from the comfort of their home using a desktop, laptop, or tablet. The program features more than 140 interchangeable options, including the full array of TimberTech, as well as AZEK, decking, railing, and lighting products and accessories. This is a quick and easy way to see how the various deck railing systems will look with your deck design, so you can select the one that works best with your unique sense of style. 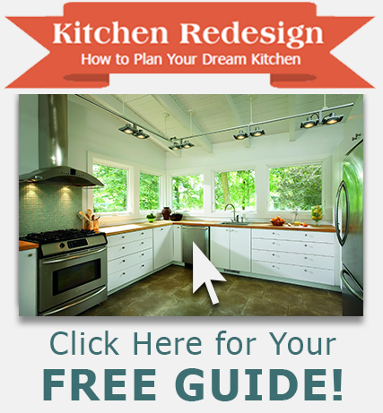 We hope you enjoy the process of designing your ideal deck! And don’t forget – if you’re thinking of building a brand new deck, or rethinking your existing deck, GNH Lumber will help you make your dream deck a reality!